The 1970s was a time of major transition in the electronics world. The transition from vacuum tubes to transistors, from point-to-point wiring to printed circuit boards, and the beginnings of personal computing were topics of all the technical publications. 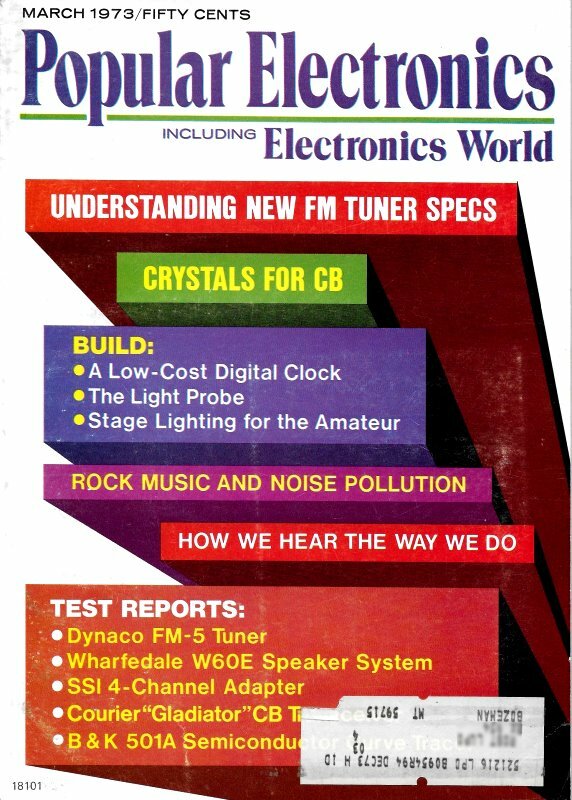 This 1973 issue of Popular Electronics included in its news roundup a couple interesting items whose effects are still dominant today - like the Supreme Court ruling that prevents patents on computer programs and electro-optical devices reading price tags in stores. Computer user interfaces have been patented, but the software itself is mostly protected by copyright - not a patent. It also reports on the videotape market gaining popularity, big growth predictions for the electronics industry, and increases in the number of engineers being graduated. In a 6 to 0 ruling, the Supreme Court recently ruled that computer programs are basically ideas rather than "things" and hence cannot be protected by patents. There had been a dispute between "hardware" companies, led by IBM, and smaller companies that provide the "software" or programs and routines without which the computer cannot be used. The ruling represents a victory for the hardware manufacturers who maintained that patents issued for programs would impede the development of future technology. Several straws in the wind are indicating a possible boom in the video tape field. One of these is the recent announcement by Sony of plans to produce 100,000 U-matic Videocassette machines during 1973 to meet worldwide demand for the equipment. Last year the company made 40,000 units for international marketing. In all, Sony has sold 181,000 video tape recorders. Along these same lines, Cartridge Television Inc. (maker of Cartrivision video tape system) has announced an order for immediate delivery of 5500 additional units by Warwick Electronics, manufacturer of equipment for Sears, Roebuck and by Teledyne Packard Bell. Such equipment is entirely for in-home use. The cable television industry may need up to 50,000 additional technicians and engineers in the next five years. These figures come from a survey released by the U.S. Department of Commerce Office of Telecommunications. The prediction is based on DOC's analysis of a manpower requirement survey distributed by the National Cable TV Association in cooperation with DOC, IEEE, EIA, and others. DOC estimates that there are more than 2000 technical jobs now open in the CATV industry and that 7000 more positions will open up in the next 15 months. The number of engineer graduates in a single school year has reached the highest level since 1950. However, freshman enrollments dropped again, according to data just compiled by the Engineers Joint Council. Those who graduated last June included 44,190 with bachelor's degrees, 17,356 with master's, and 3774 with doctor's degrees. These figures are marginally higher than the comparable figures for 1971. Note that the above figures include all engineering students and not just electronics engineers. A pen that "reads" price tags, then automatically totals the bill for a department store customer's purchases may make the present cash register obsolete. Instead of ringing up the price on a cash register of each item being purchased, the check-out clerk merely passes the tip of the instrument across a printed code placed on the item. An optical image pickup in the tip "reads" the code which is transmitted to a miniature computer that records the amount, keeps a total of the purchases and updates the store's inventory records. Developed by Bendix, the instrument resembles a ball point pen or pencil and will operate with any type of black and white bar code printed either on a tag attached to the purchased product or on the product itself. Moderate growth in the Department of Defense budget is foreseen over the next eight years as well as a proportional increase in the electronics content. This prediction was made by the Electronic Industries Association. An outlook study predicts that DOD areas which will see the most growth will be surveillance, electronic warfare, communications, command and control equipment. Currently running at about $74 billion, the EIA study sees the DOD budget growing to $94.7 billion by fiscal 1980. The electronic content of this budget, now about 15 percent, will increase to about 16.6 percent by 1980, the forecasters believe. A U.S. patent has just recently been issued to the Victor Co. of Japan for the invention and development of the CD-4 discrete 4-channel disc system. The CD-4 system provides four independent audio channels for the recording and playback of four-channel program material on records. Note that the CD-4 is not a matrix system but employs four discrete channels on a multiplexed subcarrier. Sidebands of this subcarrier extend out to 45 kHz so that a special phono pickup cartridge is required with this sort of response. This announcement was made by JVC America which handles sales and distribution of the parent company's products in the U.S. RCA has released a few records employing the Victor Co. of Japan's system. The two national associations of TV service dealers and technicians, NATESA (National Alliance of TV and Electronics Service Associations) and NEA (National Electronics Associations, Inc.) are continuing to work toward an eventual merger. Presidents of both groups met recently along with their merger committees and boards in order to iron out some of the problems that would occur as a result of the merger. Although the actual merger may not take place for many months, the two groups are working together on a number of mutual projects. The Federal Trade Commission has been examining advertising claims made by the various TV set manufacturers and has found that nearly 70 percent of these have been misleading or false. Some of these were from the larger TV set manufacturers. On the other hand, there were substantiated advertisements of uniqueness from Sony for its Trinitron picture tube, from RCA for its solid-state modules and computer-designed picture tube, and from Motorola for its solid-state receivers. Copies of the report are available from the Institute for Public Interest Representation (which had the study made for the government), 600 New Jersey Ave. NW, Washington, D.C. 20001.